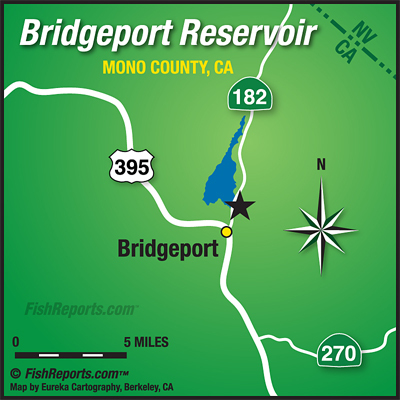 Bridgeport is still fishing excellent with lots of fish in the 1 to 2 pound range and a few fish up to around 4 pounds making a showing. Still haven't had much for fly fishing reports but the callibaetis, damsels and midges are all coming off pretty heavy every day. The trolling anglers are doing very well with night crawlers, needlefish and small rapalas, and the bait anglers are doing well with pinched crawlers, mice tails, powerbait and inflated crawlers. The trollers are doing the best in about 15 to 18 feet of water while the bait anglers are having success in water that is from about 8 to 14 feet deep.